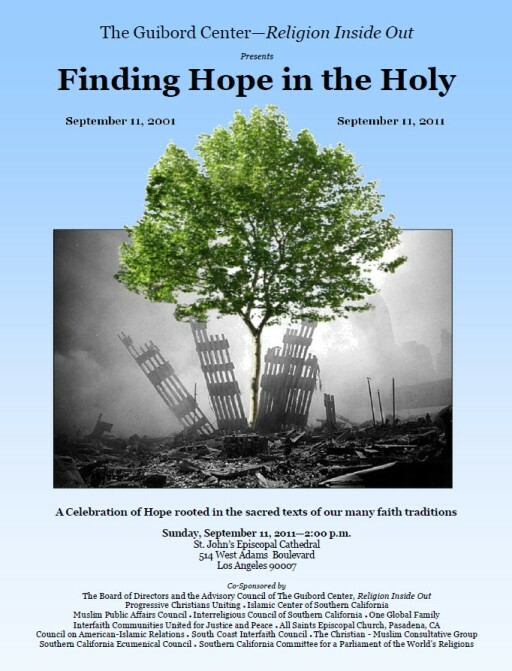 One of the events marking the 10th Anniversary of 9/11 is "Finding Hope in the Holy" at St. John's Cathedral: a groundbreaking gathering of leaders from eight world religions in a service of celebration of hope rooted in the holy -- the sacred texts of our many faith traditions. Sponsored by the Guibord Center: Religion Inside Out, this video gives voice to the common hope found in the holy by children of different faiths. Finding Hope in the Holy - September 11, 2011 from The Guibord Center on Vimeo. Read more about the making of the video and the event here. On Sunday, September 11th, All Saints Church marks the 10th anniversary of 9.11.01 with services at 7:30, 9:00 11:15 and 1:00 p.m. All Saints Rector Ed Bacon returns from sabbatical to preach “Twin Towers of Forgiveness: Ground Zero of Healing” at 7:30; 9:00; 11:15 and lead us in the call to remember those we lost and to re-energize us as we work for peace, justice and compassion for all members of the human family. In addition to our Sunday services, All Saints Church is supporting a number of wider-community events focused on unity and peacemaking. Make your plans now to attend! 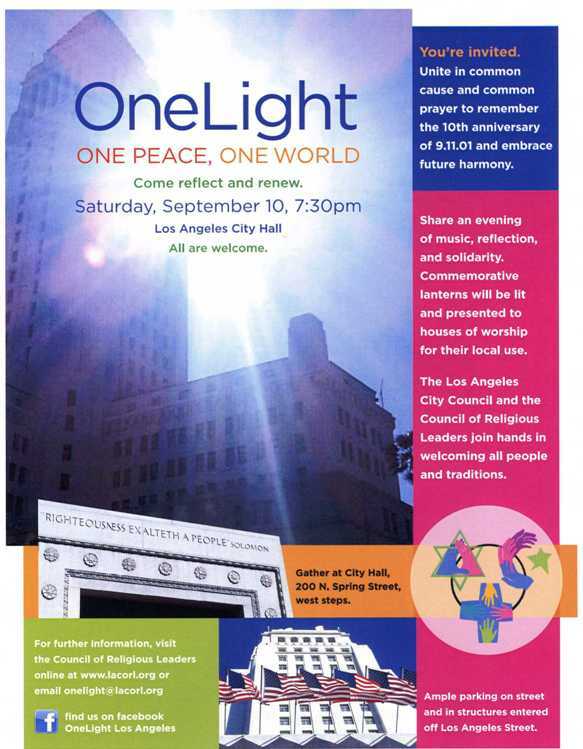 Share an evening of music, reflection and solidarity with a city-wide event focused on "One Peace, One World." 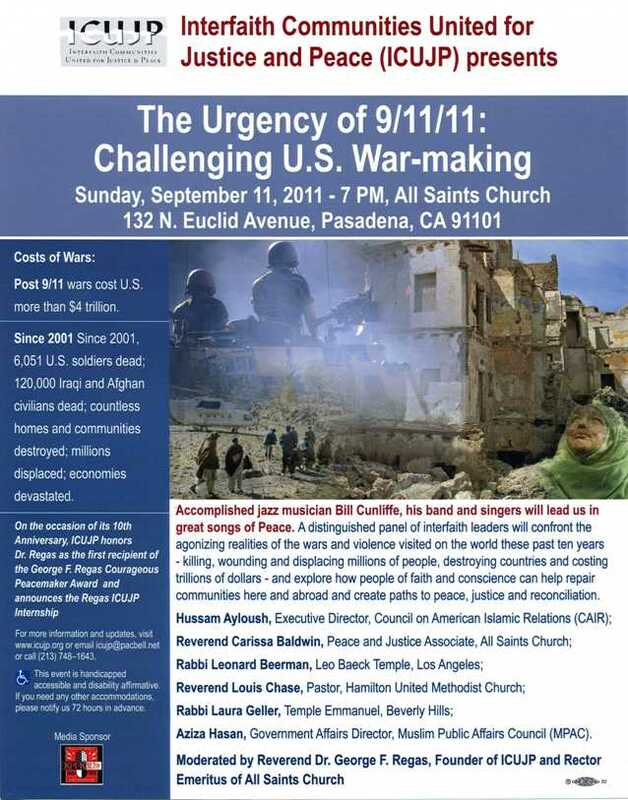 Sponsored by the Los Angeles Council of Religious Leaders we will gather at the west steps of the L.A. City Hall to unite in common cause and common prayer to remember the 10th anniversary of 9.11.01 and embrace future harmony with southland religious and civic leaders. For more information visit the Council of Religious Leaders website. 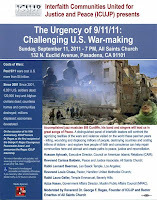 All Saints contingent will gather at ASC at 5:45 and "metro" down to the L.A. Civic Center together. Finding Hope in the Holy. Sunday, September 11th | 2:00 p.m. | St. John's Cathedral. A groundbreaking gathering of leaders from eight world religions in a service of celebration of hope rooted in the holy -- the sacred texts of our many faith traditions. For more information visit the Guibord Center: Religion Inside Out website. Sponsored by ICUJP (Interfaith Communities United for Justice and Peace) a distinguished panel of interfaith leaders will confront the agonizing realities of the wars and violence visited on the world these past ten years and explore how people of faith and conscience can help repair communities here and abroad creating paths to peace, justice and reconciliation. 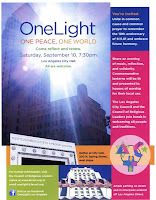 Award winning musician Bill Cunliffe will lead us in great song of Peace. For more information visit the ICUJP website. When Bryon Widner started getting tattoos as a teenager in Albuquerque, he never imagined that he would someday be portrayed on national television as a notorious example of racial hatred. At the time, he was just a high school dropout living on the streets who had fallen in with local skinhead gangs because they offered him a sense of family and a place to live. But as he grew out of his teens and drifted through his 20s, with only rage and fellow gang members to guide him, Widner became disenchanted with the hate that surrounded him. By the time he decided to make a real break out of the white supremacist underground culture at age 30, he’d wasted 16 years of his life on a cause he now despised. With his arms, legs, chest and face covered in swastikas and other flashy symbols of hate — including the actual word “hate” tattooed across one set of knuckles in capital letters, and a giant arrow splashed across his face as a symbol that he would be ready to kill or die for white supremacy — it was impossible to find work. So when the Southern Poverty Law Center offered to help Widner remove his most visible tattoos, he jumped at what he saw as a chance to start his life over. The journey he underwent as he removed dozens of tattoos and escaped the white supremacy movement along with his wife and kids has been depicted in a new documentary, “Erasing Hate,” by Burbank filmmaker Bill Brummel. While the hour-long version is airing on MSNBC, the feature-length version — currently making the rounds of film festivals in search of a theatrical distribution deal — will be released on DVD this fall. The film will also be screened at 5 p.m. Saturday at All Saints Church in Pasadena, with a post-screening discussion led by Brummel. The local screening will give the film a chance to resonate with area residents eager to prevent similar groups from spreading into Pasadena and the San Gabriel Valley. Come find out more about how the Episcopal Church came to be and where it’s going next. Bring your questions and your curiosity and plan to have some fun with Susan Russell as we explore our Big Fat Episcopal Family together.